These light, delicious sautéed beet greens are tossed in tangy vinegar and spices before being topped with roasted beets, crushed pistachios, and crumbles of goat cheese. Its hard to deny that beets have become all the rage on the food scene over the past few years. They’re everywhere these days. Most people I know have warmed up to their earthy taste. There is another part of beets though that you might not be as familiar with though – beet greens! In buying some beets over the holidays, I was struck by how bright and pretty the tops were and wondered, why people don’t eat these parts. Well, it turns out they do. Although I was intrigued by this idea to put them in a smoothie, I wanted to go a more savory route too. I hate wasting food in the kitchen. Maybe this stems from cooking with my grandmother who grew up in the great depression and found a use for every single scrap that passed through her kitchen. Maybe it comes from the “starving children out there” guilt trips used by my mom (and moms across America) to get me to eat my greens. Irregardless, I feel guilty letting food go to waste. And now that I know how delicious they can be, these tops will get used every time in my house. Beet greens can be incredibly tasty and full of nutrients. Don’t throw them out! I’ve made a salad for the blog using beets and figs and another using beets and oranges, so I wanted to try a warm dish this time. This dish is perfectly good cold too though, so you can try it both ways and see which you prefer. The first time I made this recipe was right before my mom and sister came over with a few of my nieces and nephews for a cookie baking party over the holidays. We were ambitious and thought we could get through a few different recipes and the kids would love to help. Needless to say… all didn’t go as planned. But we made two kinds of cookies and snacked on this beet greens recipe. The kicker? My mom and sister don’t even like beets! I’m a beet lover so getting this kind of validation, made this recipe a major win in my book. Roasting the beets takes a fair amount of time, so you have to plan ahead. This is downtime where the oven does the work though. I wrapped each beet individually in foil, as you can see below. They come out looking like this. If you’re not sure if the beets are done, you can insert a knife through the middle to make sure. I do this every time just to avoid having any uncooked parts at the center. No one wants that. If you know you’ll be crunched for time, you can bake the beets a day or two before and just leave them in the fridge wrapped in foil. Just warm them up before using them in the recipe. No one will know the difference. Except you, because you’ll feel less rushed and will have time to relax and drink a glass of wine. When the beets are about 10 minutes away from full roasted perfection, sauté onion, garlic, and the beet greens. Season with vinegar, mustard powder, salt and pepper and you’re almost done. Slice the beets and toss them with the greens. Your fingers will turn pink if you don’t use gloves so be careful! Sometimes I put a bit of olive oil on my fingers to keep them from staining. If they do get a little pink, no worries, it’ll wear off after a few hand washes. Now you’re down to the last step – place the veggies in a serving dish and top with crushed roasted pistachios and goat cheese (or feta). Now, eat and enjoy! See, that wasn’t too hard was it? Told ya so. If you’re a beet lover (or even if you’re not), try this recipe for beet greens! It just might change someone’s mind about this tasty vegetable. Cut greens off beets and set aside. Wash beets and scrub well to remove dirt. Wrap beets loosely in foil and place on a pan in the oven. Bake for 45 minutes to 1 hour until beets are soft and a knife can easily be inserted into the middle. Rinse greens and rip into 1" pieces, discarding the large middle stem. Set greens aside. Once beets have cooled enough to handle, rub skin off using a paper towel or kitchen towel. Cut beets into 1/2" wedges. During the last 10 minutes that the beets cook, sauté onion in oil or butter for 4-5 minutes over medium heat until softened and translucent. Add garlic and sauté 1-2 minutes longer. Add beet greens and cook for 4-5 minutes until wilted. Add sliced beets, balsamic vinegar, salt, pepper, and dry mustard. Toss to mix in. 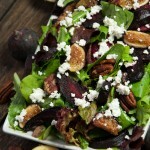 Place beets and greens in a serving dish and garnish with goat cheese crumbles and pistachios. Serve immediately. 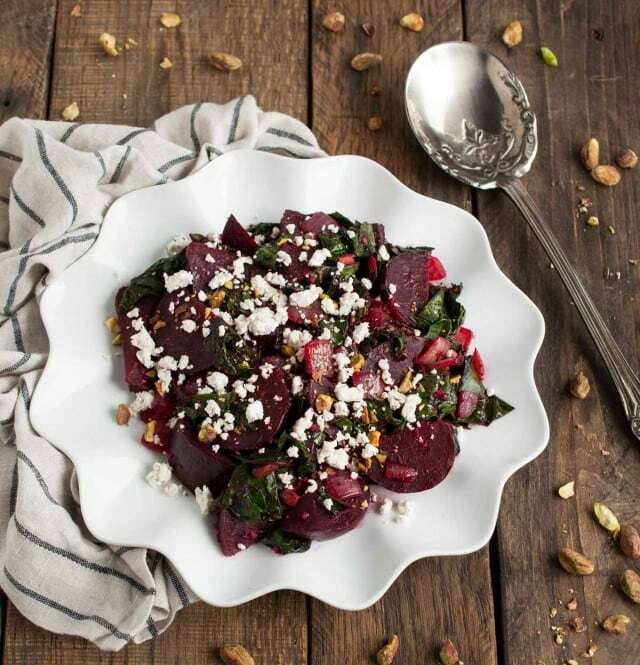 * Recipe inspired and adapted from this Roasted Beets and Sauteed Beet Greens recipe on All Recipes.